Rachel: First, tell me a little about yourselves. Jim: Before my conversion, I was a freewheeling, multimillionaire businessman. I spent most of my adult years pursuing wealth and pleasure. But all that changed when Christ came into my life. Suddenly, my world was turned upside down. Carolyn: God has sustained me through multiple challenges in life that were nearly overwhelming. I owe Him everything, and I feel so blessed to have met Jim and created the close-knit blended family that we have today. Rachel: How did the door open for you to volunteer for AWR? Jim: Another field representative, Alvin McDowell, suggested we put our energies behind AWR. We’d been donors to AWR for quite some time, but didn’t really grasp the magnitude of the work it does. Carolyn: A dozen years ago, we were speaking at a women’s retreat on Guam, and some church members insisted on driving us out to the AWR shortwave station and transmitter towers. As we looked at a map showing the regions those transmissions reached across Asia, our hearts were stirred almost to the point of tears. The geographic magnitude was staggering. Little did we know that five years later we’d be volunteering for this precious ministry. Jim: Al helped me understand that AWR – through shortwave – was able to enter vast areas of the world where other ministries just could not go, due to geographic barriers, non-Christian belief systems, oppressive secular regimes, and so on. 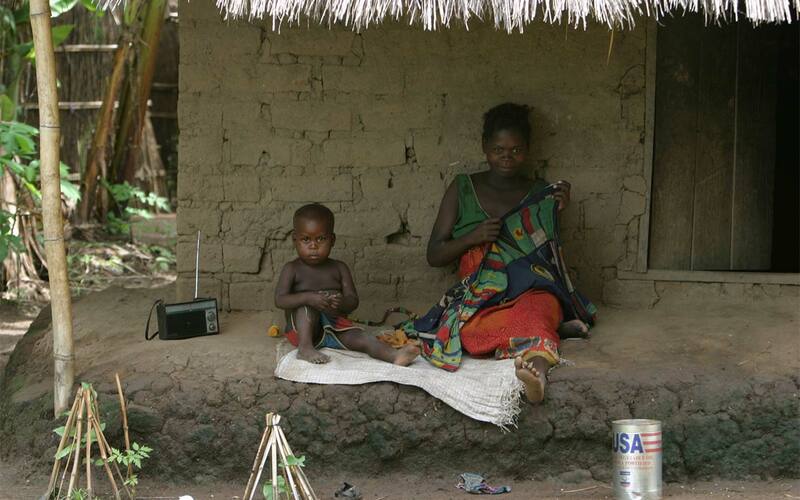 When I realized how relatively inexpensive the shortwave radios were and how many potential listeners just one program could reach, I began to understand the global impact AWR was already having in so-called “un-entered” countries. Yet I also understood there were still vast people/language groups that needed to be reached before the good news about Jesus had gone “into all the world.” When Al told me that $35 to $40 could purchase a radio that might become the “pastor” of a whole village, I felt my heart “burn within me” as the Emmaus Road disciples did when Christ explained His mission to them. Carolyn and I prayerfully “did the math” and realized that – at our age – our time and limited energy might be best expended for areas that hadn’t yet heard about Jesus. Rachel: Please share what you do as AWR volunteers. Carolyn: We most often speak in churches for the worship hour. We share how – in this one way – the uplifted Christ is drawing “all men” to Him through the ministry of AWR. We also do AWR Sabbath School lectures, vesper programs, children’s stories, ministry-related special music, and camp meeting exhibits. Rachel: You’ve had some miracle experiences during your AWR travels, correct? Jim: Definitely! On one occasion, we arrived at a very large church to set up our exhibit and make several presentations. We learned that the church bulletins had erroneously been advertising that we’d be representing another large church ministry. When we went up to present, we first said kind words about the other ministry. Then we shared that, while the other ministry is a worthy one, we were actually there to present on behalf of AWR. The mix-up seemed to make people more attentive, and AWR had a wonderful response that day. On two other occasions, years apart, I suffered from laryngitis on the Sabbaths that we were to present. I had absolutely no voice! In faith, even though I couldn’t speak above a whisper, I stepped up to the microphone; when I began to speak, my voice became clear. For the entire presentation, I continued to speak with no signs of laryngitis. Rachel: God really came through for you, didn’t He? What else would you like to tell readers? Carolyn: First of all, we’ve learned that excitement about AWR’s ministry is contagious. Over the years, a number of musicians (including some non-Adventists) have donated their time, talents, and car fuel to help at AWR presentations. They have made it possible to attract additional attendees to afternoon AWR mini-concert/miracle-story programs. Because of this additional volunteer support, sometimes more donation envelopes have been collected following an afternoon program than even were taken in the morning. When we were living in Tennessee, a little bluegrass gospel band formed on behalf of AWR. Once, we were invited to “perform” at a fast-food restaurant in the Chattanooga area. We’d never heard of such a thing! But when God opens a door … He’ll help you walk through it. So that evening, while listeners around the world were hearing the gospel via AWR’s radio transmissions, a standing-room-only crowd – sipping sodas and downing hamburgers and French fries – were hearing (and applauding!) the same messages, via a local musical idiom. Volunteering for AWR has stretched us way outside our comfort zones many times, for God works in mysterious ways – but often in very fun ways too. I believe that AWR is going to be one of the key players in taking the gospel to the world as events come to a climax as prophesied. That’s the main reason I want to support it. Jesus promised to come back when the gospel commission was fulfilled.